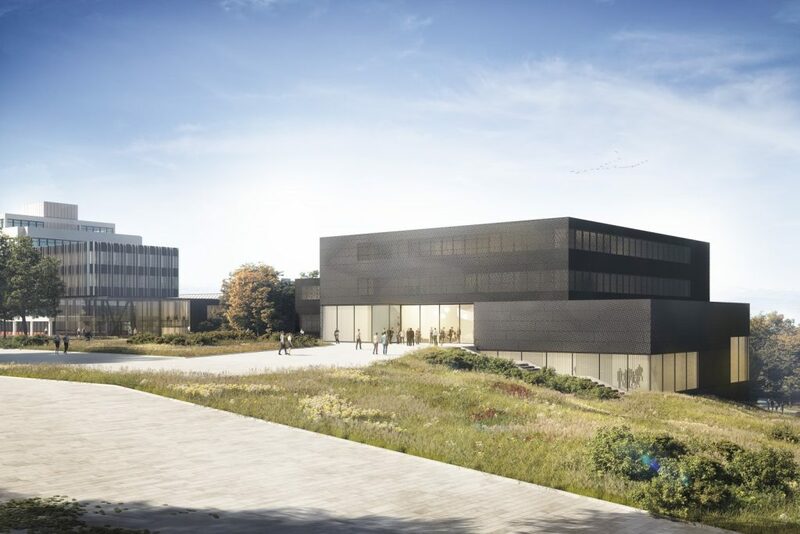 Nickl & Partner has won the contract for two new buildings on the campus of the University of Konstanz. The auditorium and seminar building as well as the administration building will complement and enrich the overall appearance of the existing university complex. Thanks to the clever positioning of the buildings on the campus, our design concept implements the intention of the master plan to create a “New Centre”. The six-storey auditorium and seminar building consists of two offset cubes, which are differentiated by further cubes that follow the topography. The entrance of the new auditorium and seminar building is oriented towards the new reference point of the “New Centre”. The administration building is designed as an addition to and continuation of the existing building block, which is topographically integrated into the meadow landscape of the adjacent Hockgraben in the south. The new building block is slid under the existing building V.
The monolithic appearance of the auditorium and seminar building makes the playful intertwining of the two cubes visible.